Ebola HF, or Ebola hemorrhagic fever is a disease which is quite severe and many times fatal in primates and humans, the exact origin of which is still not known. A majority of researches think that this disease is animal-borne, or zoonotic. It is named after the Ebola river in the Democratic Republic of Congo where it is first known that the disease started. It has also been confirmed in Gabon, Sudan, Liberia, Guinea, the Ivory Coast, Sierra Leone, and Uganda since it was first discovered back in 1976. Individuals can be educated to avoid the infection, protect themselves from the effects of it and the steps to take if they do become effected. EVD, or the Ebola virus disease, belongs to the filovirus or Filoviridae family of viruses. First appearing in 1976 in two outbreaks which occurred at the same time in Yambuku, Democratic Republic of Congo, and in Nzara, Sudan. Each time an epidemic begins, it is from a human who has contracted the virus from a wild animal through bodily fluids which are infected. It is thought that fruit bats are the natural host of the Ebola virus, and historically the disease has been known to exist in remote villages in west and central Africa, which are very near to the tropical rainforests in which the bats live. After the animal to human barrier is crossed, then human to human transmission can occur by contact with any bodily fluids that are infected, most the same as the initial animal to human transmission. The period of time between getting the disease and when symptoms will appear can range from 2 to 21 one days.Additional ways to contract the Ebola virus include touching any surfaces or needles that are contaminated.You cannot contract Ebola from food, air or water. Someone who has Ebola but has not started to show symptoms yet also can’t spread the disease. There is to date no vaccine or licensed medicine for the Ebola virus, however there are several of these products that are under development. Even though there is no specific drug to use against Ebola, intensive supportive treatment given by a hospital and health workers using strict infection control procedures is the best treatment. These recommended protective measures can help to control the infection. The disease currently has been confirmed only in west and central Africa, and it has spread mainly around the healthcare facilities in which infected patients have been treated. For travel warnings which are current and information and warnings about any potential outbreaks, you can visit the Centers for Disease Control website. You generally want to keep away from any areas in which it has been reported and suspected that the disease has spread to. Avoid any healthcare facilities if you are already there, unless you think that you could have been infected. Since the disease is mainly spread from direct contact with patients who are infected, you will do best to avoid the infection by staying away from anyone who is sick already. The bodies of the deceased that are infected are contagious as well, which makes it important to use extreme care while handling them. 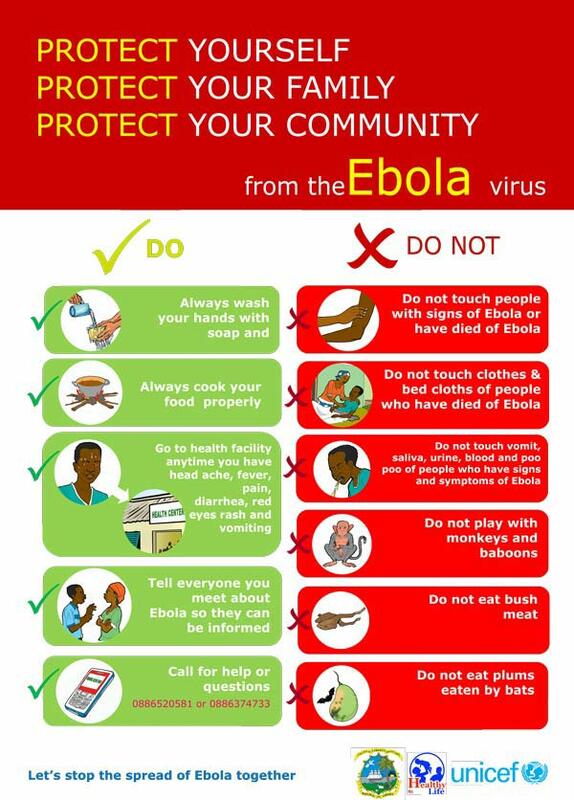 Do not have any direct contact with bodies, clothing or bedding of any infected persons who have passed away. Suspicions have been raised by researchers of the disease coming to humans through animals, likely through eating primate meat. If you are in an area where it is reported the disease exists, do not eat, purchase or handle any wild game to be on the safe side. It is completely essential to keep your hands washed thoroughly with an anti-bacterial soap, especially if you are working with the infected. You need to wash your hands up to your elbow before taking off your hospital gown and protective gear, and again once the removal is finished. It’s of course best to avoid infected areas completely, but if you are a healthcare professional or a volunteer helping infected patients, you need to use extreme caution. It is recommended by the CDC that hospital workers use disposable gloves, masks, gowns and goggles, all of which have to be worn at all times when you are around infected patients. Remember as well that you should never reuse needs which were used to treat any infected patients, and to throw away clothing and bedding that came into direct contact with the infected patients. It is necessary to use extreme caution. Immediately following its use, anything that comes into contact with an infected patient or their bodily fluids has to be sterilized. To avoid the spread of infection, use disinfectant generously in the patient’s rooms, especially around their sleeping areas. Following the proper procedures to sterilize medical instruments, rinse them immediately and thoroughly right after use while wearing the protective gloves, mask and gown. Let the instruments dry completely before you put them into a disinfectant pouch, then label and initial the instruments. In the sterilization tray, place the pouches upside down, letting there be ample space in between them so the steam can circulate properly, one inch at least. Use the sterilizer per the right procedures, then list the instruments and label them as having been sterilized. The highest level of security needs to be put into practice if you are working with infected patients. In some hospitals, plastic zipper barriers are being used to lessen the contact the health care professionals have with the infected patients. Most hospitals are quarantining affected patients, separating them from the general population to less the risk of spreading the disease. Any direct contact with the patients has to be minimized as much as possible. When you understand the nature of the disease, how it can be transmitted and how to prevent it from spreading, you are well on your way to protecting yourself from this virus. Make sure and listen to and follow any directives which are issued by your country’s Ministry of Health. If you think someone you know has the Ebola virus, support them and encourage them to seek the right medical treatment in a healthcare facility. Also, if you are choosing to care for an infected person in your home, you need to notify your public health offices of what you intend so they can properly train you and give you the right protective equipment, plus instructions on how to care for the patient and protect you and your family. This, however is not recommended, and it is instead strongly recommended that you send the infected individual to the proper treatment center. Besides the proper protective equipment and good hand hygiene, healthcare professionals also ned to learn safe phlebotomy and injection procedures, which includes the safe handling of sharps, rigorous and regular environmental cleaning, decontamination of equipment and surfaces, and the management of any soiled linen and of waste.